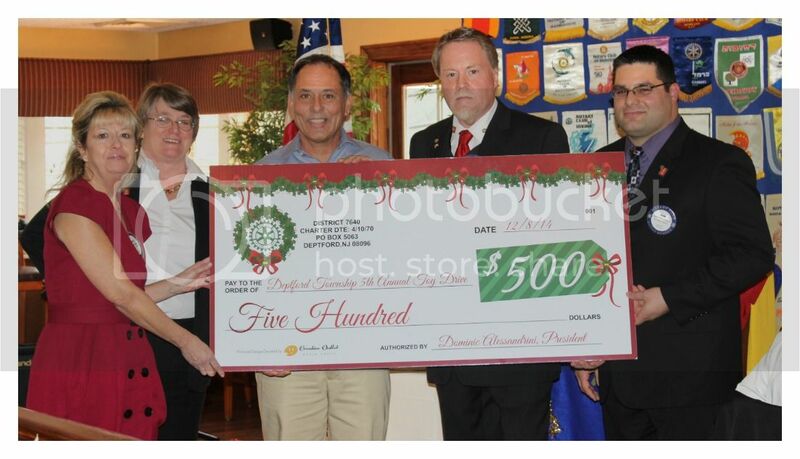 DEPTFORD TWP, — On Dec. 12, at the Deptford Rotary Holiday Lunch attended by 130 members and guests, the officers of the Rotary presented Mayor Paul Medany a Check for $500 to help with the costs of Food and Toy Baskets for the Deptford less fortunate. Left to right are Secretary Anita Gates, Vice President Pat Egberts, Mayor Paul Medany, Secretary Daniel Howell and President Dominic Alessandrini. The event was held at Filomena's Lakeside, Deptford, NJ.